A Hawaii road trip is an amazing way for you to escape the every day world and explore an absolute paradise. It is a perfect place for a honeymoon or just exploring. Local superstitions will advise that you do not take any rocks from the island because of a curse from Pele-the Hawaiian Volcano Goddess. I would strongly advise to snap some great pictures and leave this behind because you don't need bad luck following you on your road trips for the rest of your lives. Honolulu is your gateway into the islands you will want to explore what it has to offer for the day. 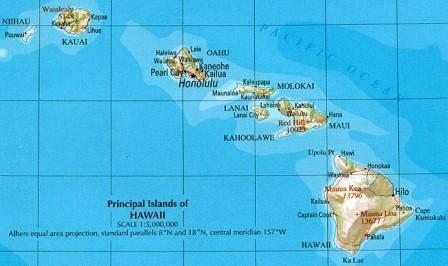 To begin planning your trip you will need to visit the Hawaiian travel page. Kilauea Volcano on the Big Island: This is one of the most active volcanoes in the world and the scenery is incredible. Luau: The Polynesian Luaus are the best way to experience the total feel of the island with the food, culture, women in grass skirts, fire dancers, etc. It is absolutely spectacular and you should take advantage of this opportunity. You can find one on Oahu at the Polynesian Cultural Center. USS Arizona Memorial: The remains of the USS Arizona on Oahu pays respects to the troops that sacrificed their lives during the Pearl Harbor attack. Diamond Head State Monument: If you hike up to the military bunkers you will want to make sure you bring water and a flashlight on this easy 1.4 mile hike to the summit of Le'ahi. Portions of the trail go through mystic long and dark tunnels and this is absolutely a spectacular view. Puuhonua o Honaunau National Historical Park: On the Big Island there is a 182 acre park that is full of archeological sites and reconstructions of tsome of the ancient Hawaiian history. You will want to make sure you take the self guided tour through the area and check out some of the turtles that will be in the beach. Kilauea National Wildlife Refuge: You can snap a picture of the Kilauea Lighthouse or explore some of the 203 magestic acres. Panaewa Rainforest Zoo: This zoo is located on the Big Island and is the only tropical zoo in the United States. National Parks in Hawaii are an excellent way for you to experience the islands and stretch your hard earned dollars. You will be able to hike through the volcanoes or explore some amazing beaches and snorkel in the beautiful waters. You will want to make reservations in advance because it does get crowded during the tourism season. Wineries are scarce in Hawaii because they do not have a long history of successful grape growing. however you can visit Volcano Winery on the big island and relax and enjoy some of the exotic wines. They will blend tropical fruits such as yellow guava with traditional grapes to provide you with a truly unique experience. Hanauma Bay is crowded but its easy to access and the views are spectacular. Makaha Beach Park has underwater caverns, arches, and tunnels that are up to 40 feet deep. Kapiolani Park Beach has water that is typically calm so it is pretty safe to check out. Molokini Crater is a sunken volcanic crater but you will need to access this area by a boat. There's lots of fish swimming around so the views are spectacular looking into this 150 foot sunken volcano. Kapalua Bay has good snorkeling if you make your way to the north side of the beach and is good for beginners. Kealakekua Bay is the best spot on the Big Island and features the Captain Cook monument. There are tons of tours in this area so give it a shot. Kahaluu Beach Park has tons of fish and sea turtles and is a very popular spot to explore on this island. Anini Beach is shallow but there is great reefs and lots of little nooks and crevasses to explore. Poipu Beach has a sheltered cove and is good for beginners. Hamoa Beach, Maui County-Hamoa beach is located in Maui and is considered to be the premier beach in Hawaii! Lanikai Beach, Honolulu County is rated as the best beach in the entire state! Waikiki Beach, Honolulu County-This world famous beach offers lots of nightlife opportunities.